Sous-vide (say- sue veed) is French for ‘under vacuum,’ an affordable and easy-to-do immersion cooking technique. 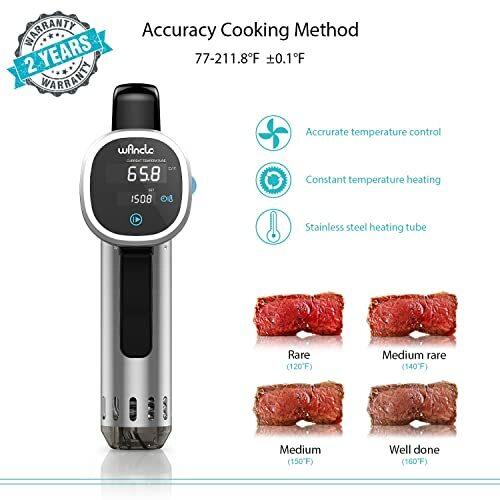 Providing accurate control for cooking meat to the doneness you love, trendy cooking geeks swear by the best sous-vide cooker. This method of cooking places meat or food into a regular sealed plastic bag in a hot water bath. A cylinder-shaped device sits inside the pot of water with a magnet at the bottom to hold it upright, or without a magnet having a clamp to hold to the pan’s side. 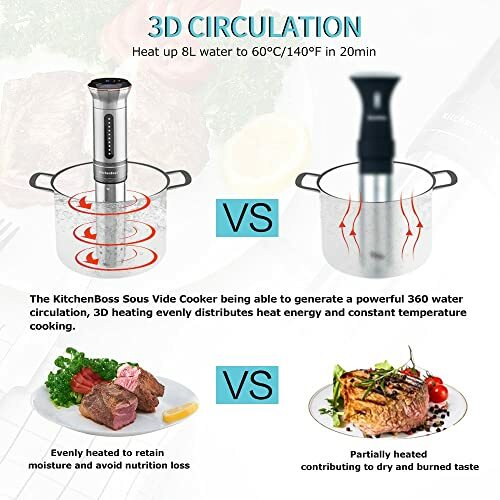 The water is heated with the device for the food to reach your sought-after temperature without overcooking the meat or food. Lovers of this small kitchen appliance support this way of cooking for a cut of meat that is consistently juicy and tender inside. Fans of the best sous-vide machine convince their cooking friends to try the uncertain task of cooking a rib eye steak to perfection. This is easily accomplished by heating the water to 129-degrees F., submerging the bag with steak into the water, coming out medium-rare cooked all the way and not just the middle. Sear it to have a brown crust in a cast-iron skillet for the type steak you get at a restaurant. It takes more time to cook this way, but the results are much better than traditional cooking on the stove or in the oven. 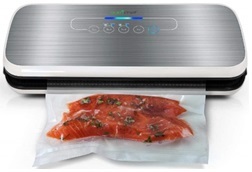 You do not need the vacuum sealer machine baggies; just use Ziplock® plastic bags. This appliance is great for freezing garden veggies, meat, poultry, and fish if you have the extra bucks to buy one. I love mine for freezing my homegrown berries and garden vegetables. 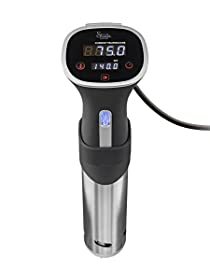 To find your best of the best unit, please read my sous-vide reviews below. What is Sous-Vide demonstration video. The ChefSteps Joule, model 4186JW120B, is an Amazon.com® Choice cooking tool in white polycarbonate or stainless-steel cap and base with white body. Both have the bottom magnet for metal pans. For the price difference of about $16 more for the stainless-steel cap and base, the white one works perfectly and is affordable. It is one of the best sous-vide machines. Being small at just 11-inches tall and weighing only 1.1-pounds, you can tuck this away in your utensil’s drawer. It heats up fast with its power of 1100-Watts. Plug the UL® listed grounded plug into a North American 110/120-Volt, 50/60-Hz outlet. The gizmo is Wi-Fi® and Bluetooth® ready to work with your iPad, iPhone, or Android. 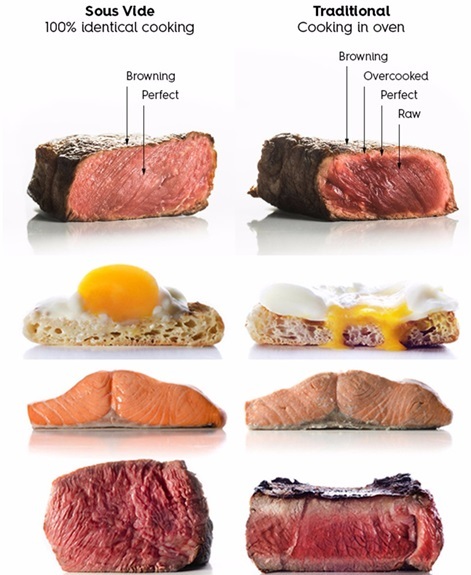 You’ll have perfect doneness every time with the Visual Doneness® feature in the Joule app. Cook from anywhere you are using Wi-Fi®. 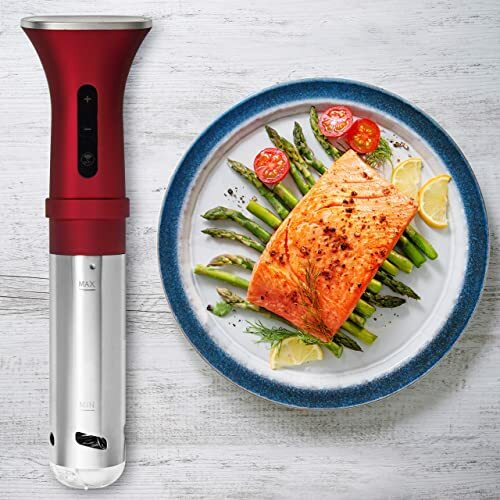 You will enjoy your food cooked with the world’s smallest, smartest, most powerful sous-vide. It us perfect for sous-vide novices and experts alike. iOS or Android is required. Joule can only be operated via the Joule app and has no physical controls. You will need Wi-Fi® to pair initially, and after that you can use Bluetooth® connectivity to control it and do not need a Wi-Fi® connection in your kitchen. You can find tons of sous-vide recipes and demo videos at their website. Gift-wrapping is available for the holidays coming and you will receive a User’s Manual and a 1-year Limited Warranty. Joule is designed by ChefSteps in Seattle, Washington, USA, and assembled in China. 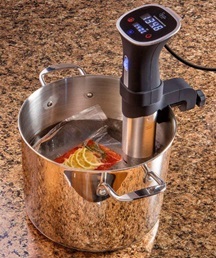 The Anova cooker, item model A2.2-120V-US, CS1000S, is a best-selling sous-vide device sold on Amazon.com®. It has a stainless-steel skirt with black plastic top and comes with the Anova app or cook manually without an app! This brand has many fans. Being small at just 14-inches tall and weighing only 2.5-pounds, you can tuck this away in your kitchen drawer. The device fits on any pot with an adjustable clamp. This unit is the best of the best sous-vide cookers. It heats up fast with its power of 800-Watts. Plug the UL® listed grounded plug into a North American 110/120-Volt, 50/60-Hz outlet. One lithium battery is required and included. Cook with Bluetooth® and control the device from your iPhone and Android or other smart devices up to 30-feet away. You’ll be cooking like a pro with no hands and no watching food cook. With no dry outside edges and cooked uniformly inside, the juices and flavors are there for your enjoyment and health. Cook your meat, poultry, fish, veggies, fruit, cheese and more with this magical device. You can find 1000s of sous-vide recipes and demo videos at their website for beginners and seasoned chefs. The detachable stainless-steel skirt and disks are dishwasher safe making this kitchen appliance easy to clean and maintain. A newer model is shown here on Amazon.com®. You’ll receive a User’s Manual and a 2-year Warranty. It is made in China. 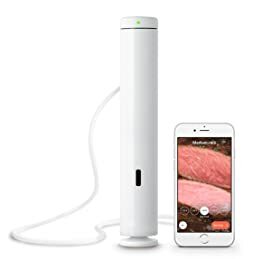 Cook the perfect steak with Anova video. The Wancle, model SVC001, is an inexpensive unit sold on Amazon.com®. It is sturdy with an LCD digital temperature timer and resists stains. Cook everything from poultry, beef, chicken, pork, seafood, eggs, pasta, beans, chocolate, baking, salad, dessert, breakfast, to vegetarian. It is 850-Watts and 14-inches tall. 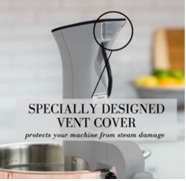 It will clip to any of your cookware to use inside any type of pot standing upright. 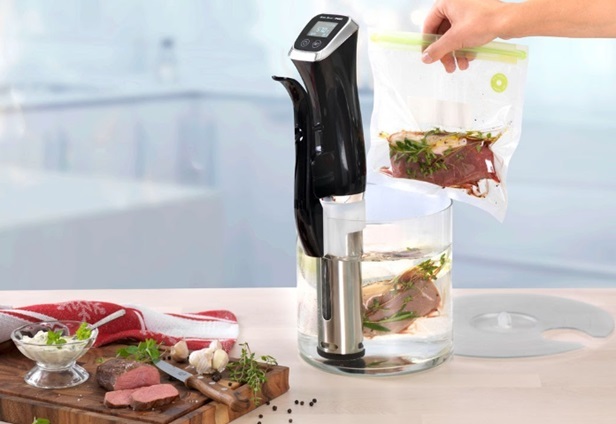 The water circulator moves the water around your food’s plastic bags for an even temperature for thoroughly cooked meat and food every time. It is ETL listed for safety. Plug the UL® listed grounded plug into a North American 110/120-Volt, 50/60-Hz outlet. You will receive an E-cookbook with more sous-vide recipes at their website. Gift-wrapping is available for those you love this Christmas with a 2-year Warranty. It is made in China. 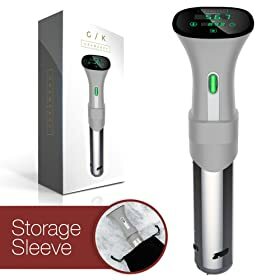 The Gramercy Kitchen Company offers a stainless-steel device with a free soft storage bag for the ASIN number B073R2PZF3 shown on Amazon.com®. No Wi-Fi® or Bluetooth® is needed and it functions right out of the box manually. The sleeve is stainless-steel and it operates at 800-Watts. You will receive a downloadable time and temperature guide to get started using this fun gadget. Use in any pan that is the water level height of 2-inches to the minimum water level mark. 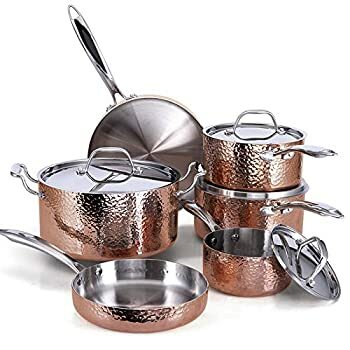 It has no magnet on the bottom so you can use glass, copper, stainless-steel, even cast-iron cookware. There are no sous-vide recipes on their website, but when available, they will send to your inbox. Gift-wrapping is available and you will receive a 1-year Warranty. It is made in China. How to make citrus chicken thighs video. 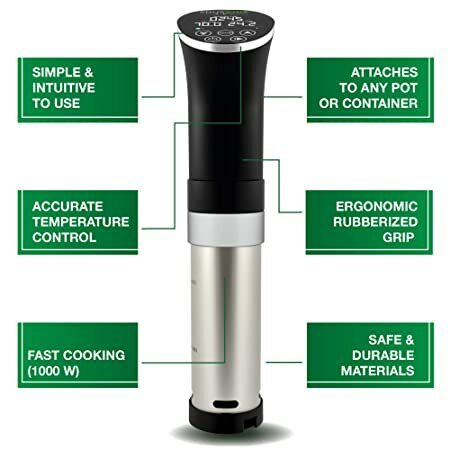 The Yeti® sous-vide device is a complete set, ASIN number B074MGYV47, shown on Amazon.com®. The free accessories include 1 hand pump, 10 each BPA-free gallon size vacuum sealed bags, 4 clips, and a bag sealing clip. The overall length is 14-3/8-inches, the diameter of the immersed section is 2-1/4-inches and the immersible section is 6-inches. With 1000-Watts of power, it heats water quickly. The more Watts, the more power. 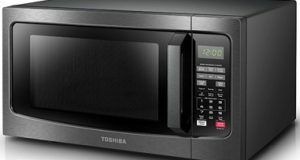 Your microwave is probably 900- or 1100-Watts and you know that doesn’t raise your electric bill. Cook everything from beef, chicken, pork, veggies, seafood, eggs, chocolate and more! 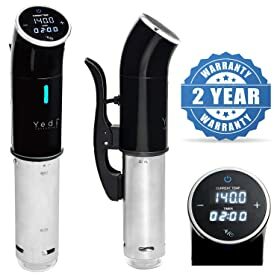 The Yedi® Houseware Appliances website and mobile app for iOS and Android has new sous-vide recipes and content uploaded every week! You will receive a recipe book, and cooking time table cheat sheets. A 2-year Warranty is included. It is made in China. 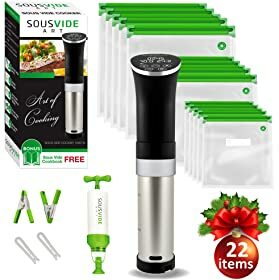 The SousVide Art cooker, ASIN number B077GXV153 sold on Amazon.com®, is a complete sous-vide unit with starter kit of 15 bags, pump, clips and free cookbook. The 1000-Watts heats quickly and keeps food cooking perfectly inside and out just like a restaurant. Have hands-free cooking to do other things. Have healthier more nutritious food with better taste sensations. No magnet on the bottom of the device gives you more flexibility to use any type cookware. Gift-wrapping is available for someone you love at Christmas. You’ll receive the kit and a 12-month Warranty. It is made in China. 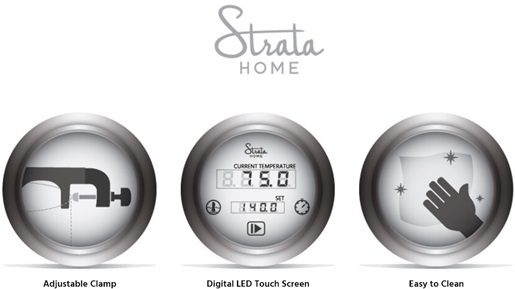 The Strata Home device, model number 121594, a Choice device on Amazon.com®, is a bright LED touch screen unit that clips to the cookpot without a magnet on the bottom of the device. The clip is removable for cleaning. The unit is 800-Watts and easy to adjust the cooking temp and time. Use the start/pause button for your needs located in the middle. It’s easy to clean since it sits in a bath of hot water and never comes into direct contact with the food. 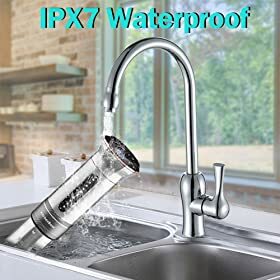 The stainless-steel pump housing and water cap are dishwasher safe, and you then reassemble the cooker when the parts have dried. This will be a wonderful birthday or holiday gift for family and friends that are into healthy, tender, tasty foods. It comes with instructions and a 1-year Warranty and is made in China. Strata Home by Monoprice video. 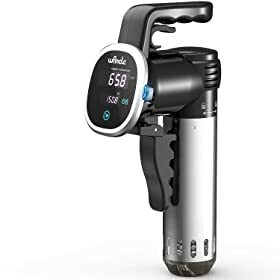 The Kitchen Gizmo sous-vide device is an Amazon.com® Choice brand, model KG-SV1, has a touch screen control panel at the top with a safety grip handle. This is a manual unit using no Wi-Fi® or iPhones. The 800-Watt unit shuts off automatically when the water level is low with an error code of EE2; see this in your manual. Remove the sleeve and hand wash in soapy water, rinse, and towel dry. The clip is not removable. A bonus recipe book is included with a temperature/time chart and you will find more scrumptious sous-vide recipes at their website. Have no more dry edges or tough insides for your meat using this device to cook everything tender inside and cooked evenly throughout. It comes in a lovely gift box to give to someone you love during the holidays. You’ll receive instructions and a 1-year Warranty. It’s made in China. 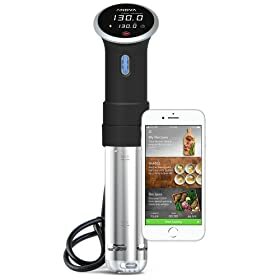 Kitchen Gizmo Sous-Vide Immersion Circulator detailed instructions video. 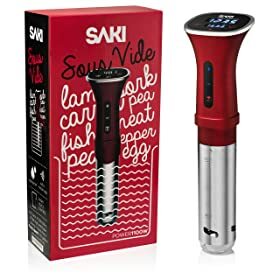 The Saki Kitchen is a Japanese cooker and is an Amazon.com® Choice product, ASIN number B07GVRY2LK. It comes in red for a splash of kitchen color with stainless-steel at the bottom. Operate it manually or with the Wi-Fi® app smart control. This is a powerful unit using 1100-Watts of electricity to get your food done faster than an 800-Watt unit. It has a digital display on the head and flow direction with an adjustable clamp. 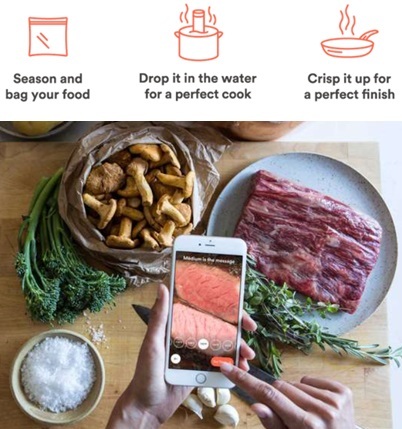 Cook from your iPhone using the app so you don’t need to babysit the food you are cooking. It is a professional unit and loved by home cooks as well with self-stirring capabilities when immersed in water. Simply attach the device to your cookpot, set the time and temperature either manually or using the app. Put your food into a sealable bag and drop into the water. When done, remove the food from the bag and enjoy. It is designed to maximize food’s natural moisture, yumminess, tenderness, flavors, and juices. You’ll think you’re eating in a 5-star restaurant. It cooks to perfection veggies, meat, steaks, ribs, rice, and much more. Gift-wrapping is available for someone in college, at Christmas, for birthdays and other holidays. It comes with a User’s Manual, 1-year Warranty, and is made in China. How to Make Japanese Miso Black Cod with Sous-Vide video. 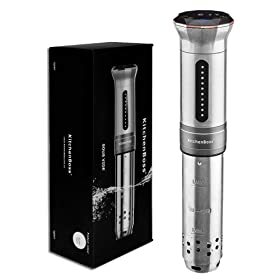 The KitchenBoss®, model A01G300S11U, is IPX7 waterproof certified, and is one of the best sous-vide devices on Amazon.com®. It comes with 10-plastic bags to simply put your food in and cook. With its 1100-Watts power, you’ll have your food cooked quickly. The temperature control digital display is easy to use and see. The stainless-steel cover is easy to remove and clean. The clamp bracket is flexible, but not removable. The water bath process cooks food evenly to a T. It’s more healthy with more flavor. The 3D circulation does it. Plug the UL® listed grounded plug into a North American 110/120-Volt, 50/60-Hz outlet and push the on button. Gift-wrapping is available for loved ones at Christmas, other holidays, and birthdays. Kids love these in their college dorm to cook without them while in class. You will receive a User’s Manual and a 2-year Warranty. It is made in China. 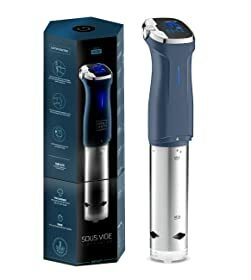 If you want a 220-Volt unit to run outside North American, this sous-vide unit is meant for you using 1500-Watts power for quicker cooking for the best sous-vide It’s also available in 110-Volt. Be sure all the air is out of the bag before putting into the water, otherwise it will float and not cook. Do not overcook in the water and do not over sear in a skillet. If you don’t have plastic bags, you can use a glass jar with lid. Never put the sous-vide unit into food such as soup; it will ruin the unit and is not made for this. Only put into water. 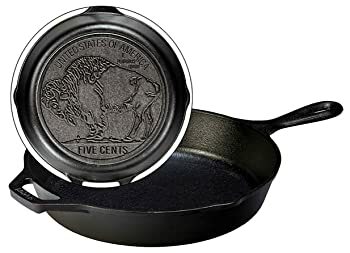 You do not put this on a stove burner; it sits on your countertop. I really like this way of cooking and I think you will to once you’ve tried it a few times. Everything is so juicy and flavorful this way. Sous-vide machines are small, easy to store, easy to clean, and produce magic in your kitchen. Happy Shopping! A Beginner’s Guide to Sous-Vide Cooking – Kitchen Conundrums with Thomas Joseph demo video.